HIT Entertainment is pleased to announce that Angelina Ballerina™ (a fiesty little mouse) will be lending her support to hundreds of ballerinas in Central Park on August 2nd, in the attempt to break the Guinness World Record for "Most Ballerinas En Pointe" at one time. Ballet dancers age 13 and up are invited to be part of this record-breaking event, called "Break the Ballet Record", to support awareness for dance. Proceeds from the gathering will benefit the Kips Bay Boys & Girls Club performing arts program, a partner of the newly launched Angelina Ballerina Stars of Tomorrow (AB Stars) campaign that promotes the joys and benefits of dance for children around the world. The goal of the campaign is to assemble 1,000 ballerinas from around the country to join together at the Bandshell in New York City's Central Park (mid-park, 66th-77th Streets) on August 2nd and stand en pointe for one minute at 6:30 PM. The current record is 220 dancers. Participating dancers are encouraged to donate $10 with 100% of their donation going to the Kips Bay Boys and Girls Club dance program in partnership with the AB Stars program. Angelina Ballerina will be present at the event alongside AB Stars dancers from the Kips Bay Boys & Girls Club to support to the ballerinas. 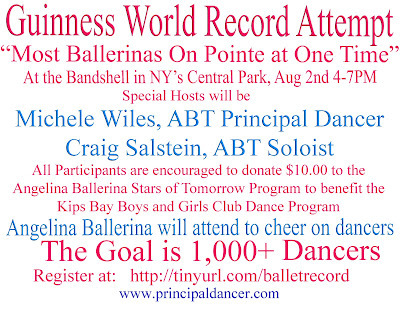 Some of ballet's most elite dancers will join the attempt to break the world record, including ABT Principal Dancer Michele Wiles who will serve as the event's host, and ABT Soloist Craig Salstein who will direct the dancers in dance steps leading up to the moment they stand en pointe. In addition, participants from the Kips Bay Boys & Girls Club AB Stars program will perform with Angelina Ballerina and host an Angelina Ballerina-themed children's activity area during the event. "Break the Ballet Record" is being organized and presented by husband and wife team Gene and Ellen Schiavone, longtime supporters of dance in New York City and around the country. Gene Schiavone is a professional photographer specializing in dance, and his clients include American Ballet Theatre (ABT), Boston Ballet, Mariinsky Theater and Bolshoi Ballet. Ellen Schiavone has been involved with ABT since 1985, first as a volunteer, then as the Chairman of the Golden Circle Council, has served on ABT's Board of Trustees and is currently head of the Costume Fund which has raised over one million dollars to refurbish and replace costumes. "We are both avid supporters of ballet as an art form, and we are thrilled about our partnership with the Angelina Ballerina Stars of Tomorrow Program and its goal to provide an introduction to the benefits of dance for children through the Boys & Girls Clubs," said Gene Schiavone. "The Angelina Ballerina Stars of Tomorrow Program is excited to be part of this record-breaking attempt. More than breaking a world record, we are thrilled to see hundreds of dancers come together in support of raising awareness for dance," said E.J. Minor, Vice President, Marketing, Retail and Creative Services, HIT Entertainment. "We are grateful for the support that the dancers are giving to the Angelina Ballerina Stars of Tomorrow Program and our partner, the Kips Bay Boys & Girls Club. This effort will surely help to inspire young dancers to achieve their dancing dreams." Launched last fall, the Angelina Ballerina Stars of Tomorrow program was developed to raise awareness for the benefits of dance, including building confidence, inspiring creativity and promoting physical health, and subsequently provide access and opportunities to kids ages 5 to 12 seeking dance education. During the past year, students at the Kips Bay Boys & Girls Club were offered Angelina Ballerina Dance Classes in Ballet, Hip Hop, Latin, and African dance with Angelina Ballerina in-class materials like "Angelina Ballerina's Tip of the Week", classroom posters, nutrition and recipe information, choreography and videos. The program will roll out to at least three additional cities by Fall 2010. To register to take part & help to "Break the Ballet Record", please click here. Would be so cool to break the record! I will add a link to my post today for you! That is awesome, I wish them success! I kind of want to go see these ballerinas now! cool, awesome... i wish your success!